Written in the context of the research conducted for my phD thesis in “Advanced Materials” at National Technical University of Athens. The goal of our team is to develop a new innovative and more environment-friendly method for the PCB through-hole plating stage with the use of Polypyrrle conductive polymer. Based on a paper posted at 1st WSEAS International Conference on Materials Science, Bucharest, 2008 under the title “Polypyrrole-based metallization of insulators – An application to Printed Circuit Boards (PCB)” with C.D. Yfantis and D.K. Yfantis as co-authors. Additional material is being added continuously. The author Spiros Kakos is a member of Professor’s D.K. Yfantis team at the Chemical Engineering school, Materials’ Sector of NTUA (Athens, Greece). Conducting polymers (CPs) were first produced in the mid-1970s  as a novel generation of organic materials that have both electrical and optical properties similar to those of metals and inorganic semiconductors, but which also exhibit the attractive properties associated with conventional polymers, such as ease of synthesis and flexibility in processing. Polypyrrole (PPy) is one of the most widely used conductive polymers, due to its high chemical and physical stability, low toxicity of the monomer and its easy chemical or electrochemical synthesis, even in aqueous solutions   . PPy may be prepared by chemical or electrochemical oxidation. 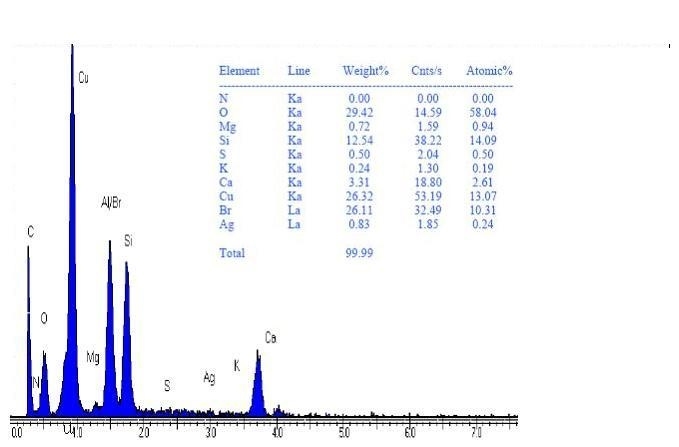 It has been proven that by inserting doping anions (Figure 1) like PTS (para-toluene-sulfonic acid) the conductivity of PPy can be increased up to 102 S/cm.   . Applications of PPy were essentially extended during last years and include now such different fields of science and technology as corrosion protection of metals, development of individual electronic devices e.g. diodes, metallization, electromagnetic interference shielding, biosensors, tissue engineering scaffolds, neural probes, drug-delivery devices, and bio-actuators   . In microelectronics, printed circuit boards (PCBs), are used to mechanically support and electrically connect electronic components using conductive pathways, or traces, etched from copper sheets laminated onto a non-conductive blank fiberglass substrate (“the board”). There are many types PCB substrate material, but by far the most common is a standard woven epoxy glass material known as FR4. The complexity of PCBs, vary from single-sided boards, where circuitry is found on only one side, to double-sided boards, to boards comprising several layers of circuitry. Connections between the two sides of a board and layer-to-layer connections are made with copper-plated through-holes (PTHs) . 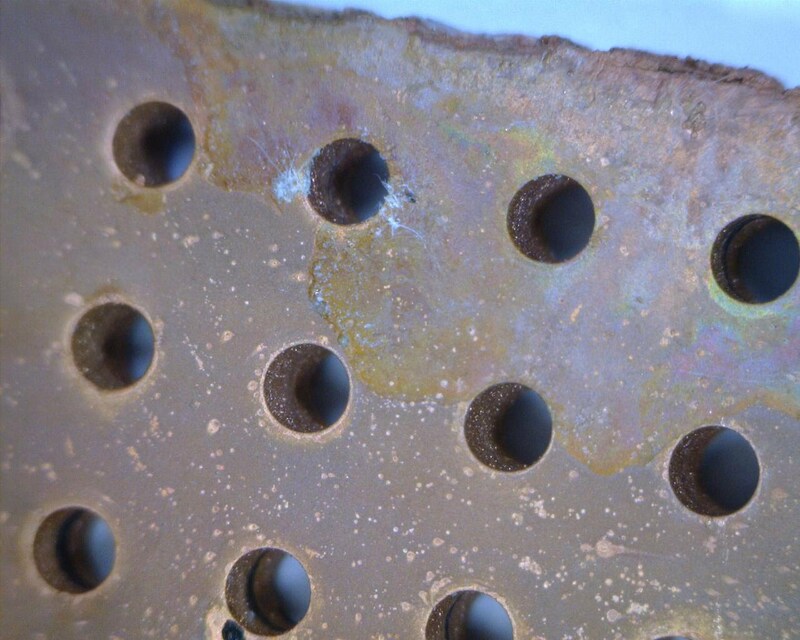 The through-holes are drilled into the laminated substrate and are then copper-plated (Figure 2). The introduction of double-sided, followed by multilayer boards, was achieved by metallization of the drilled holes with electroless copper. Autocatalytic electroless copper plating has been successfully used for over 30 years. However, this process has certain disadvantages . Firstly, electroless deposition of copper requires a reducing agent. Formaldehyde, the most commonly used reducing agent in electroless baths is toxic and poses environmental concerns. Secondly, electroless baths are generally unstable and require close monitoring. Control becomes a problem and cyanide and chelating agents have to be added, which in turn are difficult to remove from waste streams . In addition to the environmental concerns about electroless copper metallization, circuit board manufacture using this process requires the use of expensive noble-metal salts, such as PdCl2 and as many as 8- 10 steps (including rinses).The inherent disadvantages of the electroless copper metallization fostered interest in direct metallization of copper. There are processes in which the activation of the non-conducting wall of the PCB holes is effected by deposition of carbon particles or conductive polymers  . The aim of the present study is to investigate the application of polypyrrole (PPy) as a conductive in situ precoat for the metallization of PCB holes. Several variables of the process at a laboratory level were studied. In particular, the effect of the substrate pre-treatment (H2SO4)and the polymerization bath synthesis (addition of ΚΟΗ) on the peel strength of copper on the FR4/polypyrrole electrode was evaluated. An assessment of the peel strength of the copper plating was performed. 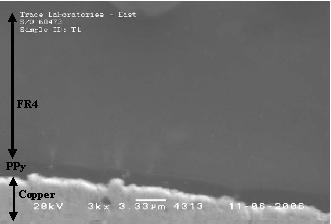 Furthermore, the interface and the thickness of the copper electrodeposited was studied by SEM/EDS analysis. Firstly, FR4 specimens (2,5 x 2,5 cm) were etched by immersion for 30 min in a firmly agitated aqueous solution containing 8% pv (NH4)2S2O8. Ammonium persulfate acts as an oxidant in the polymerization of pyrrole. PPy is polymerized on FR4 surface, from an appropriate optimized solution that contains 3.6% pv pyrrole and 4.4% pv. PTS that acts as a dopant . Thus, a new electrode is formed that can be electroplated. The FR4/PPy electrode has been electroplated using the electrolytic cell that contained a copper ion bath. The composition of the copper deposition bath was:150 g/L CuSO4*5H2O, 50 g/L H2SO4, 50 g/L CH3CH2ΟΗ (EtOH). Copper was deposited onto FR4/PPy surface resulting in the formation of a FR4/PPy/Cu sample. After being covered with PPy film, FR4 specimens were immersed in AgNO3 0,1 N solution for 10 min before metallization started. During the copper electrodeposition of FR4 substrates the current density and the metallization time were recorded. The peel strength of copper coating (Cu) on the polypyrrole-modified FR4, was measured according to ASTM-B-193-02 specification. 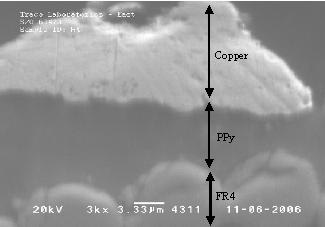 SEM/EDS analysis of the copper coated FR4 specimens was performed. The results of our experiments show that the use of polypyrrole can lead to sufficiently conductive holes to allow their metallization at a later stage. We have used spraying as well as immersion techniques for the in situ polymerization of pyrrole into polypyrrole at the hole walls. From the experiments conducted it seems that the use of spraying technique does not allow the full metallization of holes, especially in cases of PCB with more than 10 inner layers. Immersion technique looks like the only viable solution for such metallizations. 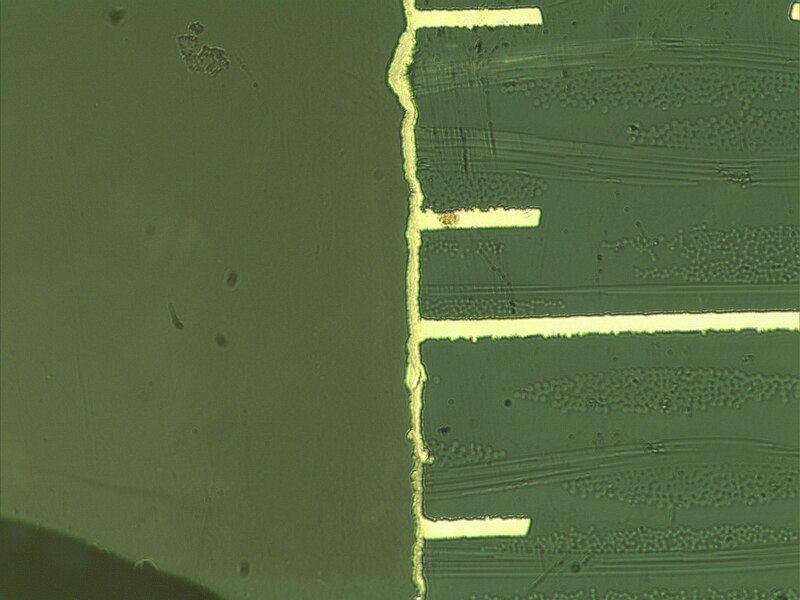 Micro-intersection analysis at 16-layer PCB in which the holes were metallized with the polypyrrole-based method of our team, has shown good copper plating results as shown in the next schema. The results show that the copper plating resulting from the use of polypyrrole as pre-coat has good quality and satisfactory continuity with the inner-layer copper. In a previous work we have tested the adhesion of copper layer on ABS specimens according to the ASTM D 3359, method B (“Cross-Cut Tape Test”) . It has been demonstrated that the peeling of the copper coating is caused by the poor adhesion of the PPy film on ABS . For this reason, we attempted to increase the peel strength of PPy on the FR4 substrate by (a) chemical treatment (etching) of the specimens with H2SO4 and (b) addition of KOH in polymerization solution. Figure 3 shows the peel strength (lb/in) as a function of etching time (min). 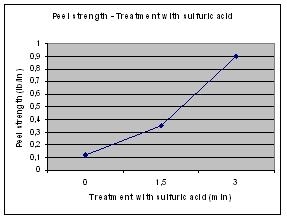 Peel strength of 0.90 lb/in was reached after pre-treatment with sulfuric acid for 3 minutes (Figure 3). Therefore, the etching of the substrate with H2SO4 has significantly increased the peel strength.This can be attributed to the poor acid resistance of epoxy resins that results in an increase of the surface roughness. Adding dropwise 6% w/v KOH to the polymerization solution results in a significant increase of the peel strength from 0.29 lb/in to 0.35 lb/in. The polypyrrole conductive layer (interface) was not of equal thickness and ranged from 4.5 μm to 9.65 μm (Figure 4). Additionally, in figure 5, EDS analysis of a Group A specimen is shown. As it is shown figure 6, the PPy layer was more uniform with a thickness equal to 1.88 μm. The EDS analysis of the specific specimen is demonstrated in figure 7. 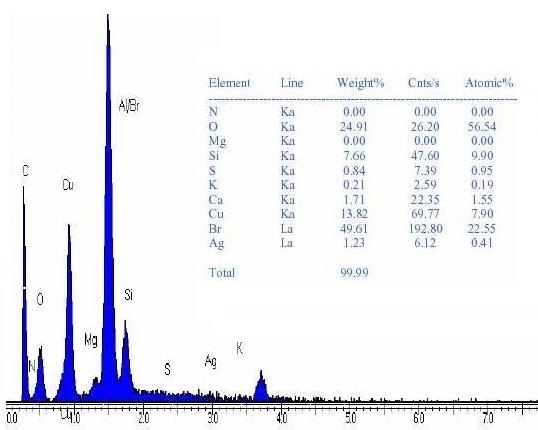 EDS analysis results (Figures 5 and 7) clearly demonstrate that the addition of KOH reduces the mass of Cu deposition. This finding is in agreement with the reduced Cu film thickness deposited on Group B specimen as revealed by SEM. Using H2SO4 as an etching agent increases the peel strength of the copper coating on the substrate up to 0.90 lb/in. This may be attributed to the roughness increase of the FR4 surface. The addition of KOH to the polymerization solution also increased the peel strength of copper on FR4. However, it reduced the mass of deposited Cu. Research paper — Good to see your research paper.made a collection of research journalshttp://knol.google.com/k/narayana-rao-k-v-s-s/research-journals-papers-and/2utb2lsm2k7a/3937#Now made a collection of research papers posted directly by authors.http://knol.google.com/k/narayana-rao-k-v-s-s/-/2utb2lsm2k7a/3954#viewAdded your paper to the collection. There are some more paper posted by some authors. I have to find out and add them.One of your statements in Save Knol – Knol is keep posting. It is good to note that these days number of people are posting knols and the number is going above 1000. Even though we may lament that those knols are not on academic topics, we will get every day some academic topics from them and we can promote them. All other posts, we hope conform to Knol TOS as an open platform for publishing and that is why Knol is not allowing them to stay. It seems Google penalizes some offenders by removing all Google facilities at one go. A strong deterrent for any normal person. Congratulations for the first PhD thesis knol — Spiros,This is probably the first case of a PhD thesis published in knol and congratulations for a historic milestone. The subject is beyond my limited knowledge, so no comments on the subject matter. Do you work on nano materials? If yes what are your views on potential of nano particles? Untitled — Nano particles are an exciting area of research. However my research does not deal with such particles. Thanks for the comment very much. I will enrich the article as soon as new publications are made.